Welcome to UNLV School of Medicine — the first allopathic medical school in the Las Vegas Valley offering an innovative educational program that includes patient experience throughout all 4 years of the curriculum. The national accrediting body, Liaison Committee on Medical Education (LCME), cited UNLV School of Medicine as creating a thoughtful and innovative curriculum that is well integrated with the school’s mission. UNLV School of Medicine now is accepting applications via AMCAS. A conferred Bachelor's degree is required for admission to the UNLV School of Medicine. Students cannot use "Advanced Placement" credits or online courses to satisfy the required premedical coursework. Economics classes will not be accepted to satisfy the behavioral sciences requirement. Although these courses deal with human behavior, the scope of information is narrowly confined to finance and monetary issues. Students in medical school require a broader theoretical and scientific foundation as physicians in training and for MCAT preparation. Recommended courses include these: Genetics, Immunology, Molecular Biology, Physiology, Statistics, and Physics. A basic understanding of the concepts taught in these courses is helpful to students seeking a M.D. degree. Required courses vary for each medical school and applicants should research requirements for each school. Applicants should also work with campus pre health advisors. Applicants may use school websites and the Medical School Admissions Requirements. Medical school pre-requisites are not selected for MCAT preparation and applicants may need additional coursework as part of their MCAT preparation. MCAT: Applicants must submit an MCAT score no later than the final application deadline of November 1. UNLV School of Medicine will only accept the new MCAT for applicants applying in 2017. The most recent MCAT score will be used for the admissions screening process. The medical school will not mix and match scores from previous MCAT exams. Metric Requirements: Minimum scores for the MCAT are set at 499. An undergraduate GPA of 3.2 overall is required. AMCAS Application: UNLV School of Medicine will only accept applications via AMCAS. UNLV School of Medicine's application deadline is October 1. Secondary Application: The secondary application will be completed online. Selected applicants will be invited to complete the secondary. There is a $75 application fee. Students who qualify for the AMCAS fee assistance program will not be required to pay the $75 fee. Applicant Photographs: Each applicant is required to submit a professional photograph, head and neck only, with his/her secondary application. This photo will be used throughout the admissions process by admissions committee members, staff, and faculty for all students who complete the secondary application. Professional photographs are strongly encouraged. Letters of Recommendation/Evaluation: Applicants may submit a minimum of three letters of recommendation and up to a maximum of five letters of recommendation. All applicants must have at lease one letter of recommendation to be considered for a secondary application. Letters must be received no later than the application deadline of October 1. Letters of recommendation must be on letter head and signed, and include contact information for the letter writer. Letters received after this date will not be considered. Applications who do not have at least three letters of recommendation by October 1 will be considered incomplete and will not receive further consideration for admissions. Letter of recommendations can be written from an individual or a committee. Applicants should select letter writers who will reflect their major activities and who know them well. The Admissions Committee prefers letters that address the applicant’s suitability for a career in medicine and as a medical student. Letters of recommendation should provide new information in the application, not restate activities the applicant has already provided. Letters only will be accepted through the AMCAS Letter Service. UNLV School of Medicine will not accept letters of recommendation by any other process. Transcripts: Applicants are not required to submit additional transcripts, unless requested to do so by the Office of Admissions. If transcripts are requested, applicants will be given a deadline for the Office of Admissions to receive the transcripts. Generally, applicants report courses in progress when submitting the AMCAS application will be required to provide those transcripts, electronically, to the Office of Admissions. Official, hard-copy transcripts are only required for applicants who are accepted to the School of Medicine. Applicants must be U.S. citizens or permanent residents of the U.S. (green card holders). Applicants must be US citizens or permanent residents of the US (green card holders) or have Deferred Action for Childhood Arrivals (DACA) status. Preference will be given to Nevada residents. *Primary family includes mother, father, grandmother, grandfather, or siblings, spouse/partner. Applicants from states adjacent to Nevada are eligible to apply. Preferences will be given to those applicants who have significant connections to Nevada. Out-of-state applicants with no connections to Nevada are not encouraged to apply. Applicants must be US citizens or permanent residents of the US (green card holders) or have Deferred Action for Childhood Arrivals (DACA) status. Preference will be given to Nevada residents. EDP applicants must schedule a consultation with the director of admissions before submitting an application through the American Medical College Application Service (AMCAS). This consultation, which will assess applicant eligibility and competitiveness for the program, must take place prior to June 15 of the application year. Applicants who do not schedule this consultation will not be eligible for consideration for the EDP. Applicants who apply via this program may not apply to other medical schools. If accepted via the EDP, applicants must attend UNLV School of Medicine. If you'd like to schedule a consultation, please send and email to admissions@medicine.unlv.edu. Who should consider applying Early Decision? The EDP is designed for highly competitive applicants who know UNLV School of Medicine is their preferred medical school. EDP is for first time applicants only. 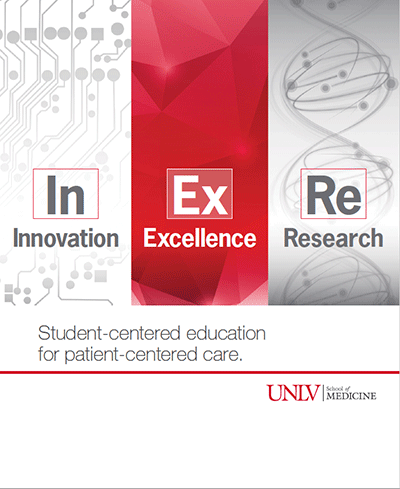 August 15: Deadline for UNLV School of Medicine EDP secondary application. All supplemental application materials are due to the Office of Admissions. September: Interviews for EDP applicants who meet eligibility requirements. October 1: All EDP applicants will be notified of the admissions committee decision. Students admitted to UNLV School of Medicine, via the EDP or otherwise, may request a one-year deferral. Deferral requests are not encouraged and will only be considered in unusual circumstances for unforeseen and serious life-changing events. Except in the case of a medical emergency, deferral requests must be submitted prior to June 1 of the first year of medical school. Accepted students who wish to consider a deferral should contact the Director of Admissions as soon as possible. An application for deferral is required. No request exceeding one year will be considered. Applicants should not apply via EDP if they are aware of a possible reason that would prevent an on-time start in the MD program. Due to the unique curriculum of the UNLV School of Medicine, the school will not accept transfer requests. Applicants must have specific cognitive, behavioral and physical abilities required to successfully complete all aspects of the curriculum, and to the development of professional attributes required to graduate with an MD degree. Students must be able to master information presented in coursework presented in multiple formats including: lectures, small group discussion and seminars, written materials, projected images, other forms of media and web-based formats, and simulations requiring different skills. Students must have the cognitive abilities needed to master relevant content in basic science and clinical courses at a level deemed appropriate by the faculty. Students must be able to comprehend, memorize and analyze material. They must be able to discern and comprehend dimensional and spatial relationships of structures and to develop reasoning and decision-making skills appropriate for medical practice. Successful completion of examinations is an essential component of the medical school curriculum for all students. Students must possess personal qualities including compassion, empathy, altruism, integrity, responsibility, and sensitivity to diversity and tolerance. They must understand and apply appropriate standards of medical ethics and must maintain appropriate personal and professional boundaries in all settings -- including when they care for patients and their families and when they interact with faculty, residents, peers and staff. Students must be able to function as members of a multidisciplinary health care team in each setting, regardless of specialty. Student must communicate effectively in English with patients, families, faculty, physicians and other members of the health care team. They are required to process all information provided by patients, families, peers, coworkers and faculty, including recognizing the significance of non-verbal responses, so that they may provide appropriate, timely and focused follow-up inquiry. Students must be capable of responsive and empathetic communication, which establishes rapport and promotes openness on issues of concern and sensitivity to cultural differences. Students must process and communicate information about a patient’s status in a timely manner, and with appropriate of accuracy and comprehensiveness, to physicians and other members of the health care team in settings in which time is limited. Written, dictated or electronic medical records of patient assessments, treatment plans, prescriptions and such must be timely, complete and accurate. The ability to interact with and utilize electronic medical records is essential. Also of primary importance is patient safety, so students must recognize when they lack the skills or knowledge to make the correct decision or manage a situation without assistance. These include required abilities in the area of observation, perception, sensory and tactile functions, fine and gross motor coordination, and stamina necessary in the examination, assessment and safe care of patients. Students must be able to obtain a medical history and perform a physical examination without the use of an intermediary. They will be required to perform a comprehensive physical examination during the Introduction to Clinical Medicine component of the curriculum. See Required Components of the Physical Exam, page 31 of the UNLV School of Medicine Student Handbook. Medical student learning takes place in an environment focused on the unpredictable needs of patients. Academic and clinical responsibilities may require working during day and evening hours, any day of the week, at unpredictable times and for unpredictable durations. Students must be able to adapt to changing environments, demonstrate flexibility and learn to function during the uncertainty inherent in clinical environments. In addition, they must have the physical and emotional stamina, stability and capacity to function in a competent manner in clinic, hospital, classroom and laboratory settings that may involve heavy workloads, long hours and stressful situations. Students must possess the emotional health required to appropriately use their intellectual abilities, exercise good judgment and complete all responsibilities attendant to their academic work, team work and patient care in a timely manner. An individual whose performance is impaired by the abuse of alcohol or other substances is not a suitable student for admission, retention, promotion or graduation. All accepted students must certify that they have read and understand their responsibility of meeting the essential functions as outlined in the UNLV School of Medicine Technical Standards Admission and Matriculation. They must continue to meet the essential functions as outlined in the UNLV School of Medicine Technical Standards throughout their enrollment. Students interested in attending UNLV School of Medicine are encouraged to fill out the Student Inquiry Form to receive timely updates. Interested in attending UNLV School of Medicine? Attend one of our informational sessions. See complete list of events. How do I apply to the UNLV School of Medicine? Applicants use the American Medical College Admissions Service (AMCAS). Can I update my application once I apply? Is there a fee to submit the secondary application? Yes, it costs $75 and must be paid prior to submitting the secondary application. I’m missing one of the required courses. Can I still be considered and take the course before starting medical school? Science pre-requisites for the UNLV School of Medicine must be completed prior to submitting the primary application. Students missing only the psychology/sociology requirement may complete the course by the end of the fall semester/quarter, if all other requirements are met. Is the MCAT exam required for application? Yes, and it must have been taken within three years of matriculation. For the 2017 admissions cycle, MCAT scores must be included with the primary AMCAS application. How many and what type of letters of evaluation and/or recommendation are required? Three to five letters will be accepted. Individuals who know the applicant well and can add to the applicant’s activities and experiences described in the application and personal statement should write the letters. The medical school does not require a specific type of letter. How do I submit letters of evaluation/recommendation? Only by the AMCAS Letter Service. How will applicants be selected for interviews? Using a review of personal characteristics and experiences in addition to traditional academic metrics. Can out-of-state students be considered for admission to the UNLV School of Medicine? Our mission is to educate physicians who will serve the state of Nevada. Priority will be given to Nevada residents, those who have previously lived in Nevada, and those who have "connections" to the state of Nevada (family, educational history, prior residence, etc.). A small number of applicants from adjacent states will be considered. Complete information is available online. Are there scholarships and financial aid for students? Yes. The medical school has secured full, four-year, in-state tuition scholarships for all 60 students in its charter class, and 40 percent of the students entering in the next three classes (2018-2020). Students also are eligible for federal and other financial aid. Accepted applicants for the charter class will receive scholarship information with the decision letter. When and where will applicants be interviewed? November 2016 - March 2017 at the UNLV School of Medicine Shadow Lane Campus in Las Vegas. What interview format will the UNLV School of Medicine use? Students will complete two standardized interviews with a faculty and a community member. Applicants also will participate in a full day of programs to learn about the school and its culture, values and curriculum. No, due to the requirements of the curriculum. If I am admitted, can I defer my admission? Deferral requests are not encouraged and will only be considered in unusual circumstances and for serious events. What are the premedical prerequisite courses required for consideration? Three semesters of biology, one of which must have a laboratory component, one semester of biochemistry, and one semester of behavioral science, psychology or sociology. Is the UNLV School of Medicine planning a BS-MD combined program? Will the school accept coursework from the community college? What will it cost to attend the UNLV School of Medicine? Visit the Student Financial Services page for more information. I received my bachelor's degree from a university outside the U.S. Will the UNLV School of Medicine accept this degree? Sign up for our weekly newsletter, Making the Rounds with Founding Dean Dr. Barbara Atkinson.